Ahryun Lee at J. Lohmann Gallery. 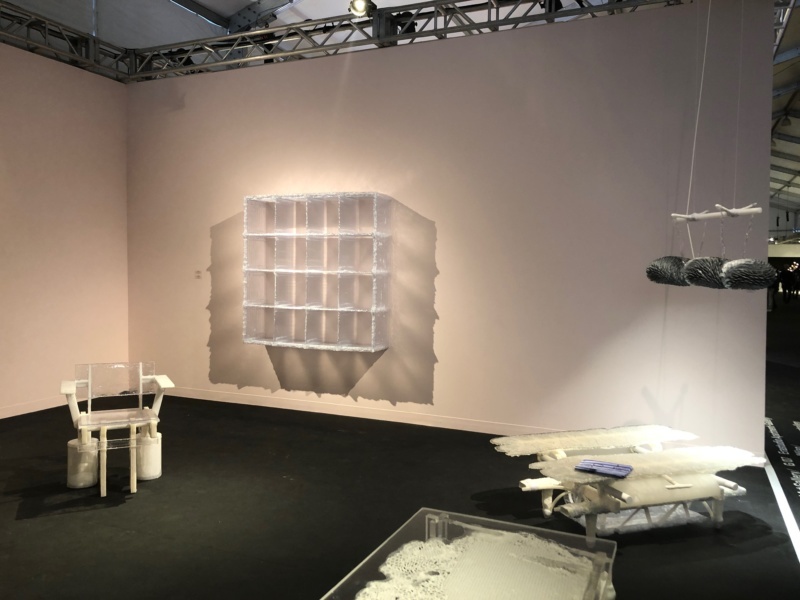 This year at Design Miami – the art, architecture, and homewares design showcase adjacent to the mammoth art fair of Art Basel Miami Beach – something strange happened: design actually let loose. The past few years, design has been inundated with refinery: marble, Millennial pink, un-abrasive neon signs, and soft geometric shapes to be placed on even more marble surfaces. Basically, the now go-to design of your favorite matcha shop. But this year, Design Miami tipped the scales, unbuttoned its pastel collar, and got delightfully weird. 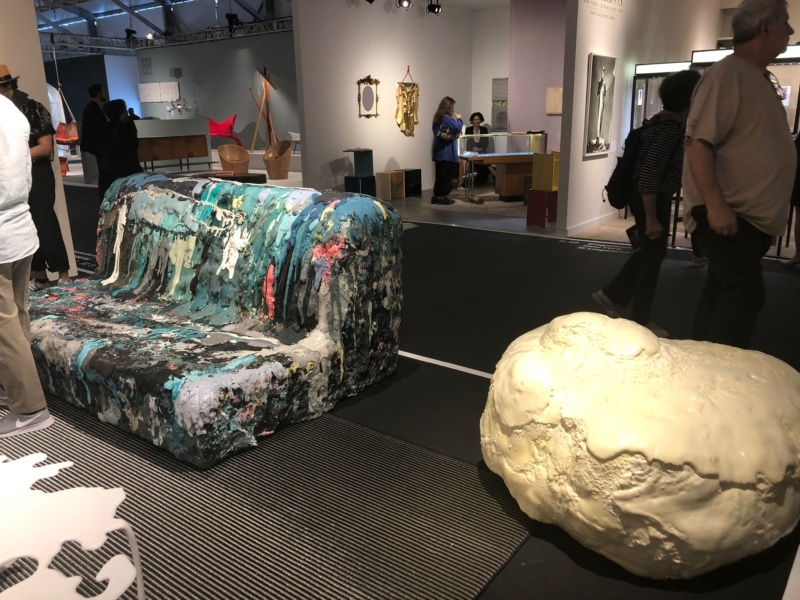 From imperfect hand-thrown pottery to kooky lighting to furniture made from materials more expected in a trash bin, we rounded up the booths that brought the unpredictable messiness of art to the regimented world of design. Theophile Blandet’s work at Functional Art Gallery. Sang Hoon Kim’s melting seats at Cristina Grajales’ booth. Following the trend of misjudged materials, Cristina Grajales Gallery showed off a group actually comfortable sculpted foam loungers by Sang Hoon Kim. These “art futons” range from blocky to goopy in shape but always maintain the colorful intrigue of an artist’s stained couch, discarded on the street. Just as unfinished, the fair’s collection of pottery and sculpture celebrated a freedom from hardness and a love of endearing funkiness. The squeeze toy inspired vases of Ahryun Lee at J. Lohmann Gallery’s Curio booth are exceptionally crafted but bring vibrant colors and texture in a playful way, while Hostler Burrows’ cute animal pottery by Jasmin Anoschkin embraced a hand-made-in-kindergarten aesthetic. Jason Jacques Gallery brought two sculptors’ whose vision of an imperfect universe united them: the rough undersea rock amalgamations of Aneta Regel and the smooth, smushed, alien creatures of Anne Marie Laureys. Works by Gaetano Pesce at Salon94. Of course, all the beautiful chaos of these homewares needed an equally eye-catching lighting scheme. At Etage Projects, Guillermo Santoma created a techno-blasting sound-system drenched in strings of a hardened substance with a matching, illuminated chandelier that called to mind the dregs of wreckage being hoisted out of the sea. 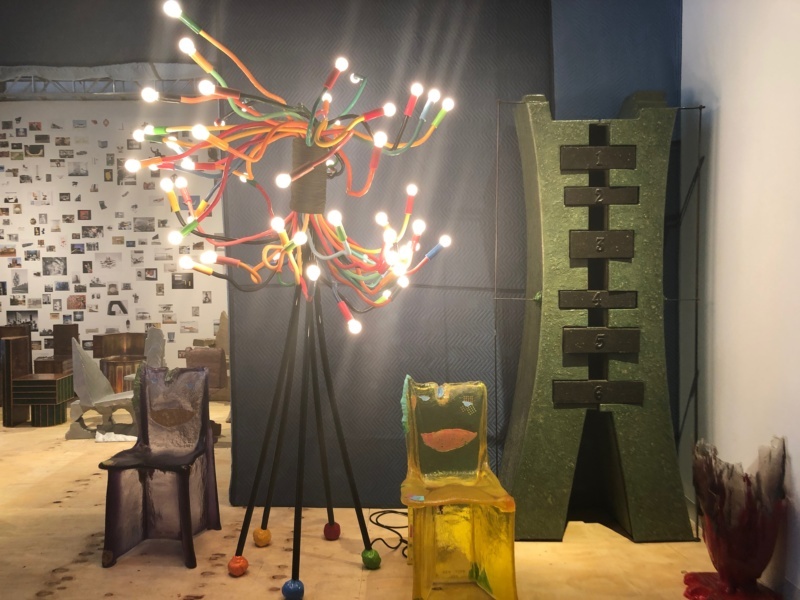 Back on land and a fair favorite, the lamp featuring 54 multi-colored bendable arms by Gaetano Pesce at Salon94 was an iconic symbol of art meets design, without losing its uninhibited kookiness. Far from clean and polished, this year’s Design Miami embraced the imperfect. Not always pretty and rarely simple, these works show us that not only may trash become treasure, but that design is only a parking lot away from art.